Hedgehogs are typically crepuscular (awake during dusk and dawn) to nocturnal animals. Wild hedgehogs typically spend most of their awake-time hunting for food. We feed our animals in the morning because that is what our schedule allows. Our animals know the routine and are very well adjusted. Most of our hedgehogs come out and take a nibble of their favorite part of the mix and then go back to sleep and eat the rest in the evening. Other hedgehog owners find that evening feeding works well for them and it certainly doesn’t hurt hedgehogs to adjust to a new routine. Moist or wet food or treats should be left in the cage for about four hours to prevent spoilage. This needs to be kept in mind while developing a routine. Your hedgehog will adjust to feeding at any time during the day or evening but it is important to be consistent in feeding at the same time every day. 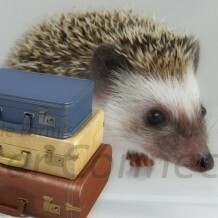 Baby hedgehogs in transition to new homes are subject to “shipping” stress. Shipping stress occurs in all types of animals and can occur at any age. The most common problems during shipping stress are diarrhea or loose stools, and/or not eating. Many hedgehogs are happy to discover a new wheel and be so absorbed with running that they forget to eat, drink, and attempt to use the litter pan. For this reason, it is a good idea to keep the wheel out of the cage for the first day or two. Using the same food as your hedgehog’s breeder is critical in reducing the likelihood of shipping stress. Keeping your hedgehog on the same food as the breeder is the number one way to prevent diet related problems. Keep treats to a minimum the first few days as some treats can upset the hedgehog’s stomach and can cause digestive issues that cause green stool. Offer only one new treat at a time so that if green stool results you can determine which food caused the problem. Always feed foods at room temperature or a little warmer. Feeding frozen or cold food can cause stomach and/or intestinal issues. If you are unsure if you are feeding food too cool watch for diarrhea. Even if your hedgehog is on a morning feeding schedule it is important to offer food as soon as your new hedgehog comes home. Hedgehogs, like all animals, need access to fresh, clean water at all times. Almost every home has slightly different smelling and tasting water and therefore the breeder you bought your hedgehog from is going to have a unique smell and taste to their water compared to your water. Some hedgehogs have a hard time adjusting to different tasting water especially if it is highly chlorinated or if it is well water with a high mineral content. Many breeders recommend using bottled, filtered, or purified water though the transition process. This type of water has a more “neutral” taste. A comparison to human drinking preferences for example is someone that likes Coca Cola and will drink several if they are sitting in front of them. On the other hand let us say this person hates Diet Coke and would rather go thirsty than drink it. Many people have a favorite brand of bottled water as well so it can be easy to relate to your hedgehog’s taste preferences. Many hedgehogs use a water bottle; some people choose to offer water in a dish. You should always ask the breeder you buy your hedgehog from if it is used to a water dish or a bottle. It is never a good idea to switch to one or the other without your hedgehog first learning how to get water from the new source. Keep in mind that your hedgehog may not drink a lot of water. Hedgehogs that are eating and having normal bowel movements are likely to be drinking an adequate amount of water. The average hedgehog will drink one to three ounces of water per night. New hedgehog owners find that their hedgehog eats very little or nothing at all the first few days after coming home. The stress of the move typically subsides naturally and the hedgehogs start eating on their own. It is important to ensure that nothing is contributing to the adjustment stress. Baby hedgehogs eat relatively small amounts (approximately one tablespoon or less of Spike’s Ultra) so it can be difficult to determine if your hedgehog is eating. You may need to count the number of pieces of food you give your hedgehog and then check the next day to see how many remain. Be sure to check in the cage to make sure food was not scattered in the cage bedding. When you are concerned about your hedgehog not eating you can offer your hedgehog treats such as crickets, mealworms, or various cat treats. Freeze-dried chicken liver treats are a favorite treat among hedgehogs. One tip is to crush the treats into a powder and sprinkle it on their food. Hedgehogs that are not drinking will not eat and can quickly become dehydrated. Please follow the guidelines above to ensure your hedgehog is drinking. If your hedgehog is having bowel movements it is eating at least something and it is a very good sign. It is important that you contact your breeder if your hedgehog doesn’t eat within the first two nights of being home. If you suspect that your hedgehog is not drinking first and foremost review the suggestions above and make sure the water itself is fine and your hedgehog has an opportunity to drink from a dish as well as a bottle. Make sure that your hedgehog knows where the water sources are located. Gently put your hedgehog close to the bottle and rub the tip with your finger, putting the hedgehog’s nose up to it so that it gets wet. Introduce the dish by placing it close to the dish and dipping its feet in the water and brushing water against its mouth with your finger. Do NOT dip the hedgehog’s nose in the water. Water in the nose can lead to aspiration (drawing a substance like water into the respiratory tract through inhalation) and pneumonia. A hedgehog that is not inclined to drink may be stimulated by adding 50% Gatorade to the water. Be sure to offer both plain and flavored water so that the hedgehog has a choice between the two. Giving your hedgehog water with a syringe is a possibility but one must be very careful, as again, it is easy to aspirate. Please contact your breeder or veterinarian before attempting this procedure, as it is possible to do more harm than good to your hedgehog. One sign of dehydration is testing for “tenting” as is done for humans and other animals. When you pinch the skin of a well hydrated human or animal the skin should spring back into place fairly quickly. A dehydrated animal will have the appearance of a “tent” of skin and takes a moment to go back into place. You should seek medical attention immediately.